Dwiyn finds himself in the strangest of circumstances. Dwiyn wakes to find himself sitting in white, perfectly cube room. There are no windows, doors, or furniture. Four walls, six surfaces, one human, and nothing else. There is no light, but he can still see clearly. He blinks twice before panic sets in. He scuttles backwards, colliding with one of the identical walls and hyperventilating with wide eyes. "What's this? Where am I? What's going on?!" Black words bleed from the wall opposite of Dwiyn's huddling form. Look into the Seventh Surface. It’s the only way out. Dwiyn squints his eyes. He counts the walls, ceiling, and floor, only accounting for six. "But... there's only six. Stop screwing with me!" The words dry and fade away. In their place bleeds a single word. The wall from which these words form peel away like old paint to reveal a steel door. He cautiously rises from his seat and approaches the ominous portal. He trusts what may lay beyond as much as he trusts the black messages - that is, to say, not at all. You may stay here forever, if you wish. Dwiyn can no longer withstand the claustrophobic confines of the room, and so reluctantly pushes open the gray, metal door. An abyssal hallway waits for him beyond the portal. He slowly makes his way down the unlit passage with the room at his back his only source of light. Just as the glow behind him fails to illuminate his path, he finds himself at a wooden door. He grabs the handle and attempts to open it, but to no avail. Words carve themselves into the wooden surface. It’s rude to enter without knocking. Dwiyn grinds his teeth at the words. The words smooth themselves away and carve upon the door a new message. Dwiyn emits a low growl and finally knocks twice on the door. It opens for him. A small chair sits at its center in a room, liken to the first, with its back to Dwiyn. It faces a window, its contents unseen within the utter darkness. On the back of the chair another message is carved. Dwiyn takes a caution as he sits down. For the first object he has encountered so far, its reality appeared solid enough. His arms are crossed and his brow furrowed. His teeth grind impatiently. A fog covers the surface of the window before him, and on its surface another message scribes itself. Light blasts itself from the other side of the window. Dwiyn covers his eyes at the sudden illumination until his sight adjusts to the glow. From the other side of window he sees a tall, skinny figure standing just beyond. It stares at Dwiyn behind a knapsack with four eye holes. The rest of its humanoid shape is a silhouette of shadow. It places a hand on the window in utter silence. Dwiyn turns to run, only to find the wooden door missing. There is nothing left in the room but him, the window, and his host on the other side. With its other hand it points four fingers at the eye holes on its mask of cloth. Dwiyn sweats profusely at the sight with uneasy breath. Dwiyn jumps from the sound of a thunderous slam against the window. Something dark and wriggling protrudes from the masked shadow's stomach. With a jerking motion the tendril flings back, and with it the impaled figure. Dwiyn hears a sloppy crunch from beyond what he can see in the dark of the other room. He feels his heart sink into his stomach and gulps hard. Another slam shakes the window, this time with the force of dozens more tendrils in the company of a hundred beedy stares. They writhe and slurp hungrily on the glass surface. Dwiyn screams and tumbles to the back of the room. He cries and rocks himself in a fetal position. "I want to go home... I wanna go home… Let me go home!" With every thud against the glass, more and more words form a message on the floor at his feet. Dwiyn sobs uncontrollably as snot and tears mix on his face. He begs to the unseen scribe of these messages. The tendrils pound more savagely from beyond the window. With each resounding shake of the room the message erases itself and forms a lengthy reply. I am the Author. You are MY main character. This is MY story. Before this, you never existed. As we speak, others read of your suffering and do nothing. Dwiyn recounts his non-existent life: the family he never belonged to, the school he never attended, the girl he never dated. For a brief instant he imagines having anything beyond the walls and nightmares, only for them to melt back into nothingness. The Author never wrote a backstory for him, and so all hope crumbles away as the window begins to crack. I shall end your suffering now. Farewell, Dwiyn. Happy Bad Ending. 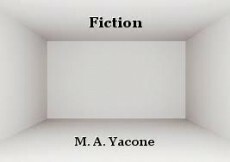 © Copyright 2019 M. A. Yacone. All rights reserved. An excellent read! Didn't expect it to end the way it did.Well done! A very interesting outlook on the lives of our characters. How do they feel? What do they think? Do they enjoy their worlds? Very well written and interesting once again. Great job. Exactly what I was going for. Thank you for your feedback! Interesting. I'll have to check out "Professor Corcoran" for myself now. And yes, removing the tag is best to prevent spoilers. Thank you! Thank you! I tried something different with this one for sure. I like it! Very imaginative and unpredictable. Great job!